Alizabethy - Card Making Addict! 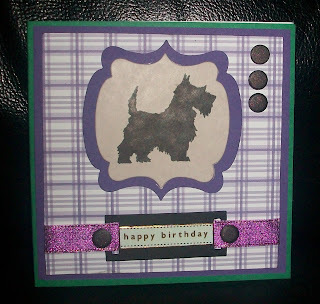 : Purple Tartan Schnauzer Doggie! This cute schnauzer dog shadow stamp is from Personal Impressions and I have teamed him up with a slightly unusual purple and black tartan combination. I've got a builder coming round this evening to give me a quote for a new bathroom, fingers crossed it will be within our budget! How appropriate that paper is for the silhouette image of dog . Makes for a delightful card. Love it . Get them (recycled) Jeans on! A cup of Tea and Piece of Cake! Fancy a Free Craft Retreat Weekend?? ?